Home» Products» Remington 1100 11-87 20 ga LT Shotgun 6 Barrel Gas Seals O Ring LOW COST! Remington 1100 11-87 20 ga LT Shotgun 6 Barrel Gas Seals O Ring LOW COST! Remington 1100 11-87 20 LT ga Shotgun 6 Barrel Gas Seals O Ring LOW COST! 6 New Remington Barrel Seal 20 GA LT. This is the SMALLER O ring, Check to make sure you don't have the 20 Standard Larger model! Viton O-rings have excellent temperature and chemical resistance. Best Buy It Now Price! 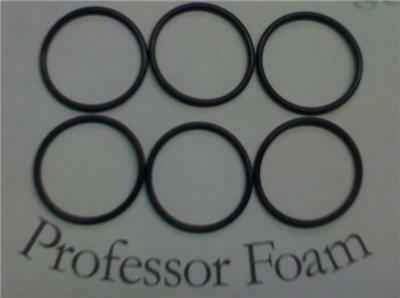 6 new aftermarket Black or Brown Viton Gas O-rings for the Remington 1187 and 1100 20 LT gauge. I STOCK all standard size o-rings in Buna 70, Buna 90, Viton & Silicone and most Metric Sizes. I mostly use 1st class mail. Tracking IS NOT provided with 1st class. Delivery Confirmation is not so if you want it use Parcell Post! TRACKING is only provided on UPS, FedEx, Express Mail and Priority Mail shipments. If your item shows shipped - I don't know when it will arrives. You can find all your shipping info on your 'My Ebay' page or on the auction page. A general purpose Viton (R) (Fluorocarbon Elastomer) compound suitable for applications requiring resistance to high temperatures and compression set. Outstanding resistance to blended aromatic fuels and straight aromatics as well as halogenated hydrocarbons. Good resistance to strong acids and steam. Temperature range -20F to 400F (-29 to 204C) with limited serviceability up to 600F (315C). Great care should be taken in regard to burning Viton (R). When burned it gives off highly carcinogenic hydrogen fluoride.